How to rip Blu-ray ISO image to H.264 AVI/ MKV/ MP4/ WMV? Home » How to rip Blu-ray ISO image to H.264 AVI/ MKV/ MP4/ WMV? Many people love to backup their Blu-ray discs into ISO image files to protect their Blu-ray discs from damage caused by repeated playback or physical broken. However, many must have experienced Blu-ray ISO playback issues when watching the Blu-ray image on most digital players, especially on a slow PC. So make sure your device is powerful enough for playing uncompressed Blu-ray contents before making Blu-ray ISO file. If you're running into playback issues or insufficient storage, here comes a solution for this situation--- ripping the Blu-ray ISO image files into H.264 AVI/ MKV/ MP4/ WMV videos with Pavtube Blu-ray Ripper. This will greatly reduce the file size and meanwhile keep stunning video quality. Pavtube BDMagic for Windows/ Mac: A best Blu-ray ripping app that is capable of backing up protected Blu-ray movies and DVDs to folder without quality loss or compressing the BD and DVD movies to MKV, MP4, WMV, AVI, MOV, TS, VOB, etc in perfect sync. Rip Blu-ray and DVD into HD videos like : H.264/MPEG-4 AVC, HD MOV, HD MP4, HD AVI, and common formats: *.mp4, *.mov, *.avi, *.flv, *.wmv, *.mpeg, etc., and also extract audio in MP3, FLAC, M4A, AAC, AC3, WMA, etc. The program includes ready preset options to convert video with right resolution for a wide range of media players and devices: iPhone, iPad, iPod, Apple TV, Xbox One, PS4 Pro, Samsung, etc. For a advanced user, you can tweak output profile parameters including codec, resolution, bit rate, aspect ratio, frame rate, channel, etc. to enhance your resulting video file. 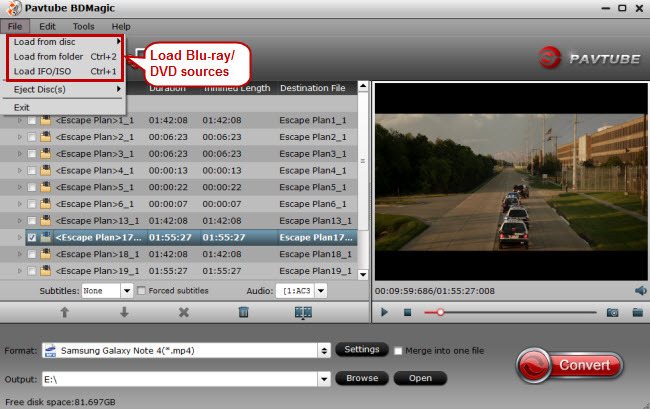 Merge multiple Blu-ray/DVD titles or chapters into one single file, trim video length to get desired video clips, crop frame size to remove black side bars; tweak video effects through brightness, saturation, contrast, volumn; adding watermark or subtitle, etc. All of subtitles and audio tracks are listed after the sources loaded. You could choose your favorite audio tracks and subtitles for the output. Convert any Blu-ray/ DVD to various 3D videos with great 3D effect: Side by Side, Top and Bottom, Anaglyph. Now just download it and follow the tutorial below. Step 1. Load Blu-ray ISO to Pavtube Blu-ray Ripper. Install and launch the Pavtube Blu-ray Ripper software, click "File" >“Add IFO/ISO” button and navigate to the Blu-ray ISO image from virtual drive. When the Blu-ray ISO is loaded to Blu-ray Ripper, you can select subtitles and audio track (English, French, German, Spanish…) for each chapter. Forced subtitles can be attained, too. Click on “Format” bar and select an HD format from the drop-down profile list from “Format”. 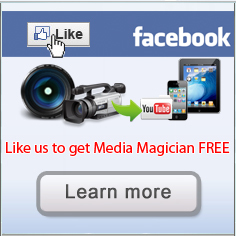 Follow “HD Video” and there are H.264 encoded AVI, MKV, MP4, WMV, MOV, TS format. Click “Convert” to start your Blu-ray ISO image to H.264 AVI/MKV/MP4/WMV conversion. If you want to convert or merge all these (*.m2ts) streams into one file, please check “Merge into one file” before conversion starts. After the Blu-ray ISO image are converted into HD video, just back to the software interface, and click “Open” to find converted HD videos. When ripping Blu-ray ISO to H.264 videos, you may click “Settings” to adjust file size and quality. There is a box of video “Bitrate” on the Profile panel, which is related to file size and quality. By default “medium quality” is applied, which means a Blu-ray ISO of 20GB will be downsized to 8-9GB, and the picture quality is great on PC and HDTV. When “high quality” is set, the file size is doubled, and video quality will be improved (unnoticeably on PC). When “low quality” is set, the file size will be cut down to around 3GB, and you get videos of DVD quality. If you wanna backup Blu-ray movies to MKV with multiple audio tracks and subtitles streams included, you can try Pavtube ByteCopy software. How to rip Blu-ray to MKV? How to extract MP3, WMA from Blu-Ray Disc? How to convert bluray ISO to MKV/AVI/MP4, etc. ?